Frome is steeped in a rich and distinctive history of many industries ranging from textiles, farming, livestock and markets, to metal-work, and printing. This diverse heritage can still be seen today making Frome an interesting town to live and work. One of these remarkable legacies’ Frome has is the ornate ‘Cockey Lamps’ which are dotted around the town; and are now listed as architectural importance. Made by the Cockey family the ‘art nouveau’ light is recognisable with its distinctive leaf pattern. Originally made by Cockey for gas, they were later converted to electricity, and are unique to Frome. Lewis Cockey came from a long established family of clock makers, and first came to Frome in 1685, where he began casting church bells – at least 62 bells in the surrounding areas are known to have been cast by Cockey. Later the family diversified, and in the early 19th Century began casting for the Gas industry. Thanks to Cockey, Frome had Gas Street lighting as early as 1831. 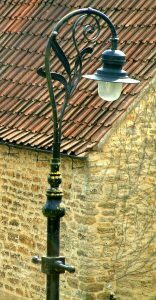 As the lamps are such an important part of Frome’s heritage, Frome Town Council has photographed and recorded the remaining lamps within the town. Photographs of some the lamps can be viewed here: Frome Cockey Lamps 2016 – please have a look at the photographs and if you know of any more lamps that we’ve missed, let us know so that we can add them to our records.